I immediately thought about houses for this week’s challenge. I love unique houses, preferably close to the beach. I live in the country with some small lakes and fields of sand which is probably as close as I’m going to get to living on a beach for now. 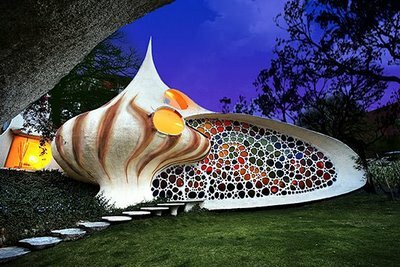 But some folks have taken it a step further – like this guy who lives in a seashell. I suppose he hears the beach tides all. day. long. Blissful? May be. I’m mildly afraid of heights but I overcame this last year when I climbed a mountain. Although I love the beach, I’d be worried about living on water. This unusual house doesn’t seem to have any escape from the tides. Brave chap. I may need to curb my enthusiasm for beach life since I’m clearly not cut out for living on water or even in seashells. I’ll make do with country life and stick to doing the beach on sunny weekends. woo! now these are unusual and I’m happy to be surprised! Wow, now those are unusual! Unusual is an understatement here! Great entry! 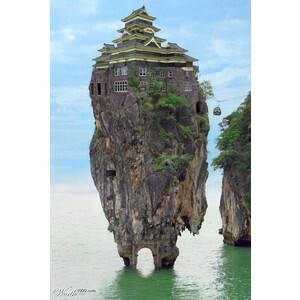 great, that house on the small island! Beautiful post! A very unique and exciting photo. I love the beach and anything with water. It’s a place I find myself at peace and truly happy. Thanks for sharing….